Next Generation USA is a team of extremely accomplished American sailors who will be representing the United States in the upcoming Red Bull Youth America’s Cup and thereby demonstrate to the sailing world the quality and skills of America’s up and coming sailors. The Red Bull Youth America’s Cup will be held in Bermuda in June of this summer. 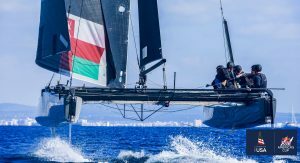 The event is the premier competition for youth sailors between the ages of 19-24, which brings together and showcases the talents of the best youth sailors in the world as they compete in a series of races on AC 45 Foiling Catamarans. Team Next Generation USA is comprised of six sailors. Team members include Helmsman Carson Crain, Tactician Reed Baldridge, Wing Trimmer Matthew Whitehead, Bowman Markus Edegran, Soft Sail Trimmer Scott Ewing and Grinder Preston Farrow. What makes their story interesting is that the Team Oracle, the cup team representing the United States, decided to back a youth team from the regatta host Bermuda instead of a team of American sailors. 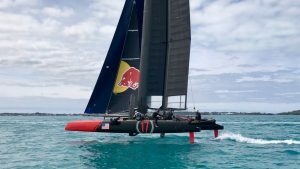 Many of the other youth teams have known for a year or two they were going to be competing in the Red Bull Youth America’s Cup, but for team Next Generation USA which only formed last summer, it has been a fast and crazy ride just like the AC 45F. The team had to secure its spot to represent the USA by completing an evaluation by Red Bull event organizers. Next Generation succeeded over team 13Fifty, the other American youth team. Demonstrate that the USA has the talent to not only compete, but succeed at the highest level of sailing. I had the chance to interview the teams Bowman Markus Edegran and ask a few questions about Next Generation USA. Q: What is team Next Generation USA for those who don’t know? A: We are a group of young sailors that came together last summer in hopes of representing the USA in the Red Bull Youth America’s Cup in Bermuda. Our goal along the way is to inspire younger athletes in the US to train in high performance boats and to try to raise the level of American competitors in these high performance classes. Q: How did the idea for the team form? A: The idea started from our Helmsman Carson Crain and then he soon reached out to Reed Baldridge and then myself. We had to submit our online entry form to Red Bull by the deadline at the end of last spring and after that we started calling around the college sailing community to look for sailors with high performance experience. A: Technically there wasn’t a guaranteed spot for the US for the Red Bull Youth American’s Cup. The only guaranteed spots were for the six countries that were being represented in the American’s Cup. The Red Bull Youth America’s Cup will have twelve teams, and the six other spots could go to any country. For the US it came down to an evaluation on the GC32 by the Red Bull Youth Sailing Director Hans Peter Steinacher. The other American team 13Fifty had their evaluation in France and we had ours in Spain and after five days sailing the boat we had a two day evaluation that determined which, if either, team would secure a spot. Q: What kind of sailing experience did your team members have before this campaign? A: Carson Crain was a windsurfer campaigning for the last Olympics, Reed Baldridge was a successful college sailor in the Singlehanded and Match Race fields. He is also involved in the Moth and Waszp classes. Matt Whitehead was a Wing Trimmer in the last Red Bull Youth America’s Cup, is a four-time F18 Youth World Champion, and ran an Olympic Campaign in the Nacra-17 class. Scott Ewing is the 2016 US 49er champion, competed in the 2016 Red Bull Foiling Generation event, and is also experienced in the Moth class. Preston Farrow is our team’s Bermudian American and is great addition to the team physically. Lastly I was lucky enough to have a pretty successful youth sailing career that led to being an important part of successful college sailing teams. While in college I had the desire to sail faster boats and got involved in the 49er class and since then have picked up kite foiling, Waszp sailing, and the M32 class. Q: What can you tell me about your achievements so far? A: We competed in the Chicago Summer Series and then in the Winter Series in Miami in the M32 class. The M32 isn’t a foiling catamaran but is a good boat for us to train in. In Chicago we finished 3rd which was great, it was our first event as a team and because boat is fairly simple, we picked it up quickly and beat some good teams. Recently we sailed in the Winter Series and it was a tight eight boat fleet. Only three points separated 3rd place and the last place 8th. We were in 3rd after the first day but the second day had challenging conditions for us and we ended up in 6th. Those are the only events our team has officially done as there is a very limited number of events that are appropriate for our team. We have also been training on a GC32 in Spain and we would have liked to do an event in that class but we haven’t been able to yet. Q: Tell me about some of the other teams you will be competing against? A: A few teams are in a similar situation to us. They are doing as much as they can and chartering a GC32 whenever they get the chance. At the other end of the spectrum there are other teams that own a GC32 such as the Bermuda and British teams. These, along with the four other programs, are backed Cup teams and have known for some time that they would be competing in the youth event. A few of the other teams have also been competing on the GC32 circuit. Even though the GC32 isn’t the exact same boat used for the event, the skills transfer over well to the AC 45F. The rules for the event limit the time teams can practice on the AC 45F to make it more of an even playing field for all teams. Q: What has it been like to fundraise for this campaign? Q: Off the water what kind of fitness/nutrition do you have? A: The AC 45 has a very physical element to the boat so we have partnered with Opex Fitness and SPT (Sailing Performance Training). Our trainer, Mike Kushner, trains us off the water and makes sure we are eating the right things and maintaining a healthy lifestyle. We send him video and other updates when we are traveling so he can keep helping us remotely. Mike has a lot of experience in the GC32 class and knows quite well the physical efforts that are required, so it works out quite well. Q: How has the fitness changed your team? A: There is a weight limit for the event and we all have our target weights. We are still working on getting the weight across our team dialed in and are working to get out bigger guys a bit leaner and lighter and our smaller guys are trying to put on a bit of weight to make sure we have the proper strength for the boat. The weight limit for the boat is around 1,060 pounds. Q: Tell me about the largest challenges the team has faced so far? A: The largest challenge so far was meeting the requirement of chartering a GC32 for the evaluation. By December 1st we had to have have a week on the boat in the books and we ended up not doing our first week of training until the last week in November because we were unable to lock down a boat until then. Since then it has been a struggle to get more training in the GC32. Behind that, the fundraising had been the biggest challenge for sure. There are expensive event fees, chartering fees, and travel fees. Ideally we would have a bit more support and backing from larger organizations. It’s a little rough but we are figuring it out and making good progress. Q: What is the cost to charter a boat like the GC32 and the entry fee to the event? A: The cost of chartering a GC32 is very high due to the nature of the boat and the maintenance that is required to keep one running smoothly. The costs of the training blocks we have done on the GC32 and AC45F along with the event fees add up to a staggering six figure number. Q: Who has been coaching you in training? A: Our coach is 49er Olympic Gold Medalist and three time World Champion Iker Martinez. Iker is now involved in high performance catamarans like the Nacra 17, M32, and GC32. He and his team have coached us in our GC32 training in Spain and will come down to Bermuda for our training this week. Iker will also be in Bermuda with us for the big event this summer. Q: How will the practice doing to be between now and the event? A: We are allowed seven days of training before the official training that happens right before the event. We are completing our seven days throughout a ten day period in Bermuda. In the next two weeks our team and the Bermuda team are sailing on Oracle’s AC 45F and sharing time. After we get back to the states I am planning to head a campaign in the M32 class using the fourth Winter Series event as a tune up for the World Match Race Tour competitions to follow. I will be supported by crew (Matthew Whitehead, Scott Ewing, and Ian Stork) that overlaps with our Red Bull Youth America’s team and the racing should be a good experience for all of us going forward. We also plan to have one more training on the GC32 in early April. That will probably be our last practice as a team before we go back down to Bermuda in late May to get ready for the official training.